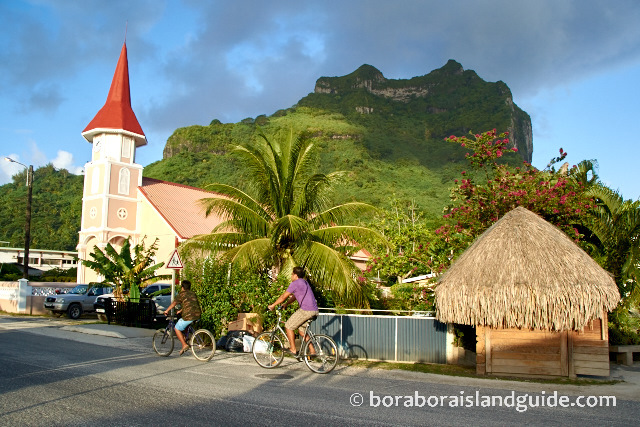 Hire a bike to get around the island from your Pension accommodation. 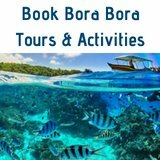 There's a wide variety of Bora Bora pension accommodation, at different levels, to suit all budgets. Here's practical matters you need to consider when choosing a family pension, guest house or hotel. When you vacation in a resort you have large grounds and an exquisite private beach and pool to relax around. 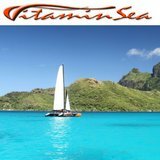 But when you stay in Bora Bora pension accommodation you will want to get out and around the island more. 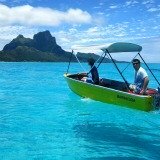 Bora Bora does not have regular public transport. So the location determines how easy it will be for you to get to eating places, shops and beaches. Some hosts offer to drive you to attractions. A few pensions provide bicycles and some have bicycle hire available nearby. 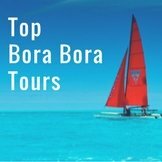 Transport to the best Bora Bora restaurants is easy, as they have a pick-up and drop-off free shuttle service. Taxis are available, but the island community is small and spread around the perimeter, so you can't always rely on a taxi being where you want it, when you want it. 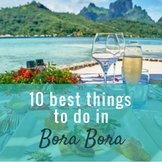 Everything on the main island of Bora Bora is located along the Circle Island Road which runs around the narrow, flat, coastal strip. 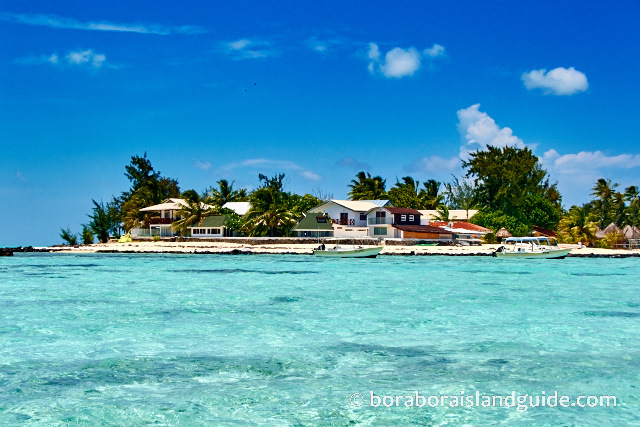 If you're here for the beach it's important to know that although some Bora Bora pensions are situated near the lagoon there is no beach outside or nearby. Only some parts of the main island have sandy beach alongside the lagoon. 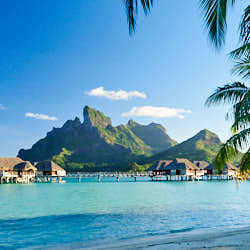 Staying along the famous Matira Beach stretch is a fabulous location. 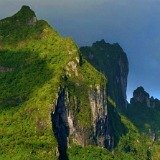 The temperatures in Tahiti are wonderful for most of the year. To be able to stroll out the door onto the long stretch of white sand that has been voted 'world's most beautiful beach' is very special. There's a vibrant atmosphere as you are sharing it with both locals and tourists. 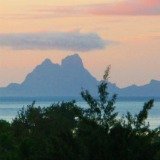 Holidaying here in Bora Bora pension accommodation is quite a different experience to the private exclusivity offered by the resorts, including Le Moana, which is tucked away on Matira Beach. This popular area of the Circle Island Road is lined with small family hotels and islanders' homes. You can wander along the road and find a variety of delicious eating places, and little shops selling an amazing range of wares. 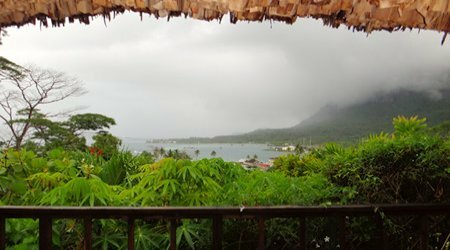 There's a choice of Bora Bora pension accommodation close to the main village of Vaitape. 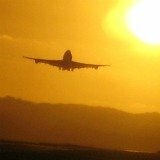 Staying there means you will be close to a supermarket, shops, banks, the Post Office, and a few cafes. 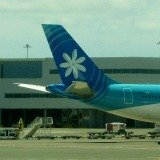 You will also have easy access to Vaitape Wharf, which is the transport hub in Bora Bora. We've always found a taxi waiting there. The fare to Matira beach is about $10. 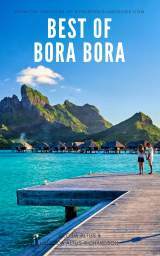 If you would like to be in a quiet, romantic location, the only Bora Bora pension awarded 3 tiares is located on the steep mountainside here. 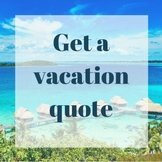 If you are thinking about staying in Bora Bora pension accommodation outside of the areas of Vaitape, Pofai Bay, or the Matira Beach to Sofitel Resort district, make sure that you get a cheap enough rate to make it worthwhile being away from the main areas of interest. 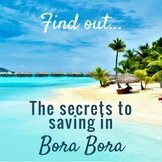 You can read information about price range and different styles of Bora Bora family pensions here. 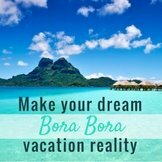 Here's a description of the popular Bora Bora pensions, family homes and hotels for you to choose from. 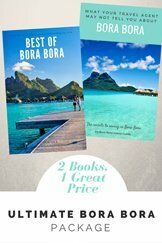 You can explore more ideas for how to have a budget Bora Bora vacation here.